Even before Ayrton Senna's death in the San Marino GP at Imola in 1994, Michael Schumacher had started to lay his claim to the Brazilian's mantle as the world's best driver. Having risen through the ranks of karting, Formula Ford and Formula Three in Germany, the 'wunderkind' first showed his real mettle as part of Sauber-Mercedes' Junior Team in the World Sportscar Championship. But it was when he made his F1 debut at Spa in 1991, standing in for jailed Bertrand Gachot at Jordan, that the F1 world sat up and took notice. Within a race, Benetton had stepped in and snaffled him from underneath Eddie Jordan's quivering nose. His blend of raw speed, shrewd racecraft, superb wet-weather skills and supreme tactical acuity marked him out from the start as the man most likely to challenge Senna. And like the Brazilian, Schumacher exhibited a willingness to commit the on-track professional foul if it was necessary. In his first full season in 1992 he rallied Benetton behind him, and thus began the legend of a man who demanded the complete attention of his team, at the expense of his teammates. That season he won his first Grand Prix, at Spa, and in 1993 he won more. But it was that tragic 1994 season which saw him rise to the top. He won the opening two races, and was chasing Senna at Imola when the Brazilian crashed fatally. But thereafter, though Schumacher became the new yardstick, controversy was never far away. Benetton was accused of cheating that year, and after a three-race ban for ignoring a black flag, he finally won his first title only after pushing Damon Hill off the road. Armed with the same Renault engine as Hill in 1995, he made a much cleaner job of his second title, but then dismayed Benetton by switching to Ferrari for 1996. A third title eluded him that season, but after a poor start to 1997 he clawed back Jacques Villeneuve's advantage until they went into the final race in Jerez with the German a point ahead. Since 1994 Schumacher had done much to rehabilitate his image, but he sullied it again by trying to take Villeneuve off the road after the French-Canadian had caught him out with a surprise overtaking move. This time Schumacher lost out, and Villeneuve clinched the title. Since then Ferrari has struggled against McLaren, but Schumacher ran Hakkinen close for the 1998 championship and was challenging again in 1999 when he crashed on the opening lap of the British GP at Silverstone and broke a leg. Sidelined for much of the season, he even considered retirement, but came back stronger than ever in Malaysia. There he gifted victory to teammate Eddie Irvine, to help him in his championship fight with Hakkinen, but in Suzuka observers questioned his commitment as he trailed the Finn home. Schumacher soon put pay to those critics by wining the 2000 World Championship, Ferrari's first since Jody Scheckter in 1979. The following year, in Hungary, he equalized Alain Prost's record of 51 GP victories and gained his fourth World Championship title. He was completely dominant in the 2002 World Championship and thus equalled Juan Manuel Fangio's record of five World titles and went on to win titles in 2003 and 2004. In 2005 Ferrari struggled and there questions about his motivation but he remained at Ferrari in 2006 and chased Fernando Alonso in the fight for the World Championship. At Monza, however, he announced that he would retire from the sport at the end of the year. He lost any real chance of the title with an engine failure in Japan but went out with honour with a fabulous drive in Brazil, but it was not enough to win the title. Schumacher had grown weary of the constant grind of F1, but he soon became bored during his retirement. So bored that he started spending his own money to race in the German Superbike series. He had several accidents, in one of which he suffered serious neck injuries. He also kept busy in his role as a consultant at Ferrari, working both on the road car and the F1 side of the business. When Felipe Massa sustained a very nasty head injury during qualifying for the 2009 Hungarian Grand Prix, Ferrari asked Schumacher to sub for him for the rest of the season. 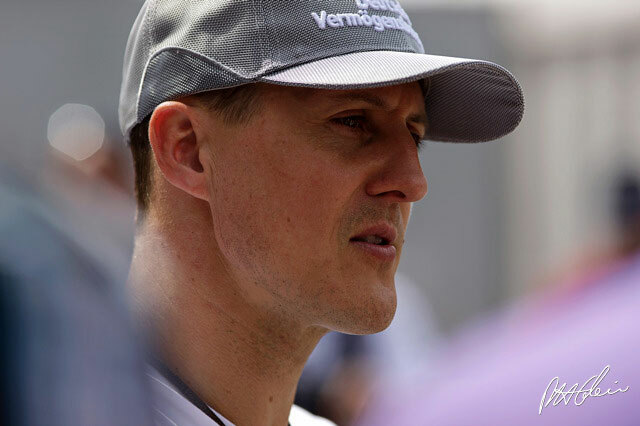 Schumacher jumped at the chance, but doctors eventually ruled that he was not fit enough to race because of the lingering effects of his motorcycle accident. Still, the seed had been sown. Schumacher wanted to race in F1 again. At the end of the 2009 season former Ferrari technical director Ross Brawn offered Schumacher a drive for 2010. Given the chance to work with ally Brawn again, and to race for Mercedes, which had bought the Brawn team, Schumacher was thrilled and said yes. His comeback season was a disappointment. At age 41 he was going up drivers nearly half his age. In the past 40 years only one driver over the age of 40 had won a championship F1 race - Nigel Mansell, 41, took an easy victory at the 1994 Australian Grand Prix driving a very fast Williams. Furthermore, the Mercedes W01 was not a competitive car, plus it had nasty understeer which is something Schumacher hates. For the first time in his F1 career during the years he completed a full season, his teammate outscored him. Nico Rosberg earned 142 points compared to the 72 by Schumacher who ended up ninth in the championship. Rosberg finished third three times while Schumacher's best finishes were a three fourth places. There was also a reminder of the dirty driving tactics Schumacher was infamous for when he forced Rubens Barrichello within inches of the pit wall in Hungary as Barrichello tried to pass him. Still, Schumacher really enjoyed working with the team and developing the car. He was confident that he would be better in 2011, and the hierarchy at Mercedes was convinced Schumacher would win again.